There are currently over 100 million students waiting to become the next generation of engineers, rocket scientists and astrophysicists to get humans from Earth to Mars and beyond, but they may not be able to fulfill their potential simply due to a lack of access to a quality education. According to a study from UNESCO, more than 100 million young people worldwide, 62 to 66 million of whom are girls, are not attending school of any kind. Hundreds of millions more are unable to afford good-quality or safe schools. However, groups like OneWeb and ONE are aiming to provide universal Internet access worldwide by 2020, greatly expanding the ability to use educational resources online. Nevertheless, Internet access does not guarantee a quality education. To address this problem, imagine if there was a massive, free online academy where any student or teacher with broadband could learn science, technology, engineering, art and math (STEAM) from educators around the globe, as well as the greatest minds in their fields, including NASA scientists, cutting-edge researchers and NewSpace engineers? On top of that, what if they had an artificially intelligent tutor and mentor to guide them in their learning? That's what the world's first NewSpace education program, Enterprise In Space (EIS), is trying to achieve, and it all begins with one giant class science project: the design, launch and recovery of a 3D-printed spacecraft that will orbit Earth with 100+ active and passive student experiments and a link to an AI to help the students run them and analyze their data. To pull it off, EIS, a nonprofit program of the National Space Society, has drawn up the plans, put together an expert team of space veterans, raised $27.5 million in in-kind donations and partnered with some of the biggest names in the NewSpace industry. Now, all it needs is $32 million to put the plan in motion and set a course for the stars. To engage students in STEAM education and space exploration, EIS is hosting contests and enlisting students from all grade levels—kindergarten all the way through postgraduate education—to design experiments to be flown aboard a 3D-printed orbiter dubbed the NSS Enterprise. From now until the spacecraft is launched in 2019 or 2020, the winning experiments will be used as the basis for online curricula and lesson plans to populate EIS’ massive open online course platform, known as the EIS Academy. Once launched, the NSS Enterprise will orbit our planet for up to one month, carrying not only the experiments, but also Ali, an advanced artificial intelligence that will manage the active experiments. Ali will also serve as the voice of the spacecraft, allowing student teams on Earth to engage with the AI platform using natural language. In fact, Ali will eventually act as a personal tutor to students from around the world. The EIS Academy will serve not only elementary, middle and high school learners, but also university, doctorate and postdoctoral students as well. EIS will host competitions seeking experiments dedicated to advancing the state of the art in 10 areas. 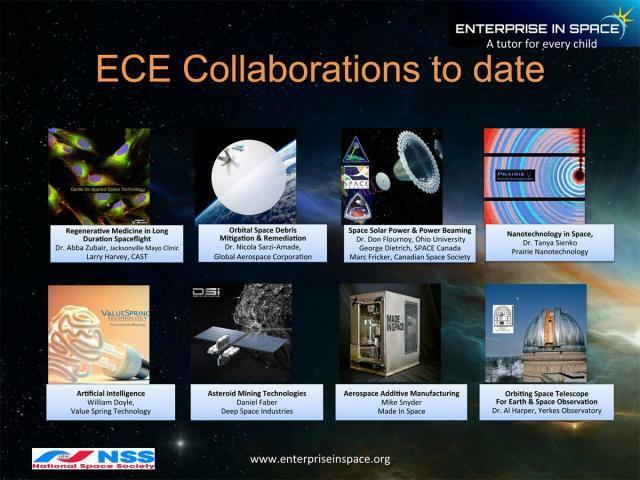 The contest teams will utilize and submit proposals within the Enterprise Centers for Excellence (ECE), where expert researchers and cutting-edge businesses will curate an extensive database of knowledge related to exciting topics such as space-based additive manufacturing, space-based solar power, stem cell research and more. Zielinski explained that the additive manufacturing, space solar power and orbital space debris mitigation and remediation ECEs are already well developed. Two competitions are nearly ready to launch and will see students at the university and postdoc level participating with established NewSpace businesses to pursue some very challenging scientific concepts. In the case of the space solar power ECE, hosted in partnership with Ohio University, SPACE Canada and the Canadian Space Society, the winning team will actually send an experiment aboard the NSS Enterprise that will test the ability to generate solar power in space, such as collecting sunlight aboard the spacecraft and delivering power wirelessly to a freeflyer for its mission orbiting Earth. In the case of the orbital space debris mitigation and remediation ECE, the team will work with Nicola Sarzi-Amadè and Global Aerospace Corporation to utilize the company's Gossamer Orbit Lowering Device to deorbit debris in space. While students will be able to monitor the progress of their experiments aboard the NSS Enterprise, the complete EIS Academy will be made open to the public, with students and teachers anywhere able to rely on Ali as a personal tutor and mentor. In many school systems around the world, students have new teachers with every grade level. In turn, the knowledge, interests and learning style of a student will have to be picked up by new teachers year after year. Teaching coursework for different student learning styles is difficult. Ali, however, will be able to accompany every student as they grow and act as a tool for teachers to address the needs of their classroom more quickly. At the same time, students will also be able to access Ali on their own time. That way, any topic that isn’t addressed in class can be addressed by the AI. Additionally, Ali can direct the student to a teacher in the EIS Academy who can provide him or her additional topic information in greater depth. Ali will be built by Value Spring Technology using the firm's enterpriseMind platform, an AI capable of deciphering and contextualizing natural human language similar to the way that the human mind works. Thus, students and teachers will be able to speak with Ali naturally. More importantly, Ali will be able to adapt to the student, learning his or her needs and modifying the teaching style as the student develops. In an upcoming article, Bill Doyle, one of the inventors of enterpriseMind, will provide greater detail about exactly how the technology works. 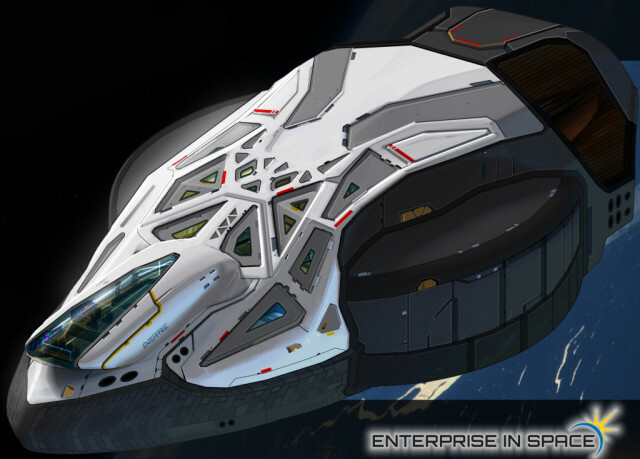 The design for the NSS Enterprise is no ordinary spacecraft. Chosen through a crowdsourcing campaign, the winning submission was from Stanley Von Medvey. The design is meant to be inspired by science fiction, and once it goes into orbit, it will be the first spacecraft with the name “Enterprise” flown in space. The spacecraft’s sci-fi geometry, however, is unlike any typical satellite or shuttle, opening up new manufacturing opportunities and engineering challenges. Made In Space, famous for now installing two 3D printers aboard the International Space Station, has been selected as the prime contractor for the construction of the NSS Enterprise. The company will leverage its expertise with additive manufacturing to 3D print the airframe of the spacecraft. To do so, Made In Space will use a modular approach, breaking the design down into individual, components before printing them and assembling them into the complete NSS Enterprise. This method will both allow the team to print the pieces of the spacecraft on a smaller 3D printer and give the EIS team the ability to configure payloads, including perishable experiments that will needed to be loaded into the NSS Enterprise just before launch. The ability to 3D print a modular, satellite-style spacecraft will also act as a demonstrator for a new technology that Made In Space is developing for NASA, a process for 3D printing and assembling large-scale structures, like satellites, from the International Space Station. If Made In Space is able to 3D print the NSS Enterprise, which is estimated to measure 8 feet long and weigh 1,000 pounds, the firm may also be able to 3D print satellites aboard the International Space Station. To get the NSS Enterprise into low-Earth orbit (LEO), EIS is currently in talks with private space companies to determine if the orbiter can be carried as a secondary payload on a commercial launch vehicle. If so, the spacecraft will be deployed into LEO and coast in free drift for most of its journey, though cold gas thrusters or gyros will be used to orient the orbiter as onboard experiments dictate, say to pick up video of the Earth for a geography class. 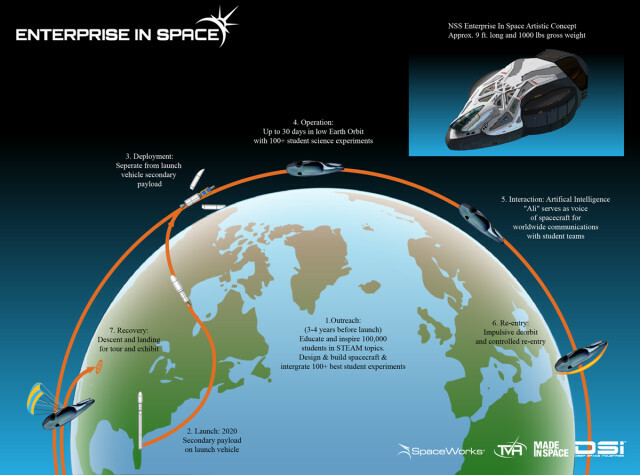 If EIS determines that the NSS Enterprise will more closely resemble a capsule, the physics of reentry are less complex. At a certain altitude, a parachute deploys and the capsule simply falls back to Earth. A spaceplane, on the other hand, would land more like the Space Shuttle, a longer, slower reentry with the spacecraft banking left and right before a parachute deploys and the NSS Enterprise coasts to its target on land. For reentry, the spacecraft won’t be controlled from the ground, but through onboard sensing and a predetermined programming. Of course, the EIS crew, which is still scouting their mission control outpost, will be able to take over manual control if necessary, but Becker said that he hopes to program the spacecraft to execute a reentry program after it has been in orbit after a certain amount of time, at which point a kick motor will redirect it towards Earth. EIS is working with partner company Terminal Velocity Aerospace, a subsidiary of satellite design company SpaceWorks Enterprises, to develop the ablative coating or clamshell that will protect the spacecraft during reentry. SpaceWorks, too, is in on the project and has helped the EIS team to draw up the preliminary physics calculations for the design of the NSS Enterprise. Once EIS finds a launch provider and the $32 million necessary to begin construction on the spacecraft, SpaceWorks will finalize the designs and hand them off to Made In Space and asteroid mining company Deep Space Industries to build the orbiter. NSS Senior Vice President Bruce Pittman has watched the EIS program develop since it was adopted by the NSS early on. As the Chief System Engineer in the NASA Space Portal Office and the Emerging Space Office at the NASA Ames Research Center in Silicon Valley, Pittman has worked on countless NASA projects and played a key role in the commercialization of space. Of course, to successfully complete its mission, EIS must obtain funding, which is a crucial variable in the ultimate design of the spacecraft, according to Alice Hoffman, EIS program manager. Hoffman has worked as project manager on such complex projects as the $6.2 billion expansion of Chicago O’Hare airport and the Chicago Bears’ $660 million Soldier Field. Of course, the goal is to realize the full potential of the NSS Enterprise, making it large enough to include the university-level experiments. To do so, EIS is in fundraising mode. The group is looking to obtain $20 donations from individuals, earning them virtual crew memberships on the spacecraft, as well as large donations from charitable organizations and corporations. While $20 will get your name flown on a chip stored on the NSS Enterprise, $30 million will give you naming rights to the NSS Enterprise (Sponsored by You) and $10 million will allow you to name the artificial intelligence or choose her voice or visage. More importantly, what better way to demonstrate a commitment to education that will be a game changer than by funding the foundation of NewSpace education?